We all eventually suffer neck/back or arm/leg pain at some point in our lives. Most adults, if they had an MRI taken of their spine, would have herniated discs, bone spurs, "wear and tear" changes, that are, unfortunately, referred to as degenerative changes. That itself is not a problem. Usually, with time and/or conservative treatments like physical therapy, chiropractic care, anti-inflammatory drugs, acupuncture, steroid injections, etc., we get better. Rarely, we don't improve and surgery becomes an option. In most cases, it should be a patient's last resort option. However, carefully selected surgical patients for cervical/lumbar surgery should do well, will leave the hospital a few hours after surgery, and will be pleased that they went through with surgery. Your doctor can explain the risks, benefits, and alternatives in detail so you can make an informed choice. The following should help explain some surgical concepts: the spinal cord sits in a long hallway, the spinal canal. The nerves pass out from the hallway thru doors called the neural foramen. The canal has a floor (the disc) and a roof (the lamina and yellow ligament). A disc herniation is like the floor bulging up in to the hallway. In some patients, the roof caves in or gets thick causing a narrowing of the space in the hallway. The end result of the hallway getting narrow is called spinal stenosis. All that "stuff" bulging or caving in takes up the space the spinal cord and nerves should have. The concept of surgery in these cases is easy to understand... the space needs to be opened up, that is, "decompressed". Surgery to deal with the floor involves removing the piece of the disc or whole disc that bulged up, a discectomy. Cutting away all or part of the roof is a laminectomy and opening up the doorways is called a foraminotomy. Performing surgery microscopically allows preservation of much of the spines' support structures; magnification and illumination allows clearer visualiztion of anatomy and pathology. You will see in the video below this concept in use. VIDEOS on this site are of Dr. Kalia's operations. Some patients with cervical disc herniations pressing on a nerve or the spinal cord will need the whole disc removed from an approach thru the front of the neck. 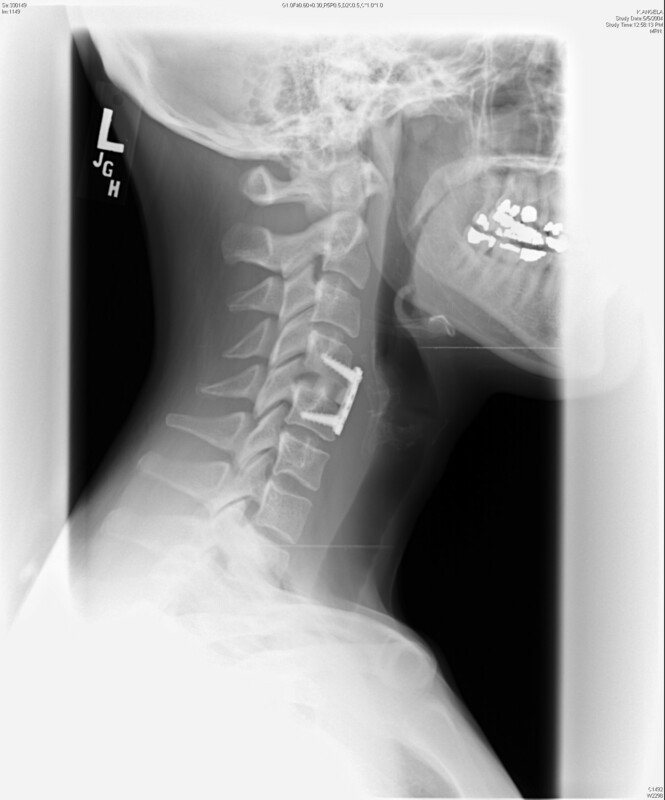 In current practice, when the disc is removed, the space of the disc is replaced with a bone graft (usually from a bone bank donor) along with a titanium plate affixed to the front of the spine, called an anterior cervical discectomy and fusion (ACDF). Patients usually walk out of the hospital a few hours after surgery. In the near future, artificial disc replacement may replace fusion surgery; but for now, an ACDF is the most commonly used approach. Some patients are candidates for a surgery to just remove the piece of disc that herniated or have a foraminotomy. If the disc herniates out to the side, this is a good approach and avoids a fusion. Your doctor will guide you as to the preferred approach in your case.